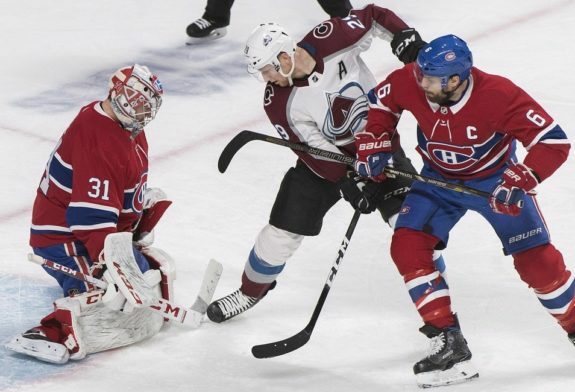 MONTREAL — Carey Price stopped all 28 shots he faced for his third shutout of the season as the Montreal Canadiens blanked the Colorado Avalanche 3-0 on Saturday night. Brett Kulak, Jesperi Kotkaniemi and Jordie Benn, into the empty net, scored third-period goals for the Canadiens (24-17-5), who had dropped three of their previous four games. Semyon Varlamov gave up two goals on 30 shots for the slumping Avalanche (20-17-8), who have lost nine of their last 10 games. After two scoreless periods, Montreal got a goal from an unlikely source when Kulak scored his second of the season to break the deadlock. With the Canadiens playing shorthanded, Kulak scored right off a faceoff in Colorado’s zone at 8:21 of the third. The goal revitalized the home side and Kotkaniemi made it 2-0 at 10:39 on a one-timer after nifty stickwork by Jonathan Drouin along the half-wall. Benn added the empty-netter with 1:16 left in the game. With Montreal’s recent scoring woes — five goals in its previous four games — coach Claude Julien shuffled his top three lines to provide a spark on offence. Julien moved Brendan Gallagher and Phillip Danault to the top line with Drouin, sending Max Domi down to centre the second line. Tomas Tatar, who’s played the entire season with Gallagher and Danault, was demoted to the third line alongside rookie Kotkaniemi and Paul Byron. The Canadiens are 1 for 20 on the power play in their last six games. They’re 0 for 27 on the power play at home dating back to Dec. 1. Notes: Nathan MacKinnon saw his eight-game point streak snapped. … The Avalanche have conceded 41 goals in their last nine road games.